Craig V. Hamilton is The Lena Goodwin Trimble Professor of Music, Director of Bands, and Coordinator of Instrumental Studies at Ouachita Baptist University. He earned his Ph.D. in Music Education from the University of North Texas, Master of Music Degree in Trumpet Performance at Arkansas State University and Bachelor of Music Education Degree from The University of Southern Mississippi. Under Dr. Hamilton's leadership, the Ouachita Bands have toured throughout the United States and Europe; recorded six CDs with the Mark recording label and performed at State, Regional and National conferences and meetings. Dr. Hamilton is also the Artistic Director and Principal Conductor of the award winning Hot Springs Concert Band, a position he has held since 1999. Dr. Hamilton is a contributing author for the Teaching Music Through Performance in Band series, GIA Publishers and is the editor for the "Conductor's Corner" of the ACB Journal. His professional affiliations and awards include Phi Beta Mu, Pi Kappa Lambda, Who's Who Among America's Teachers, Arkansas School Band and Orchestra Association, College Music Society, National Band Association (NBA), Association of Concert Bands (ACB), and College Band Directors National Association (CBDNA). Dr. Hamilton has served as the Arkansas State Chair for CBDNA and NBA and was elected to the ACB Board of Directors in 2012. In 2014, Dr. Hamilton was chosen as a VIP by the Conn-Selmer Corporation. To learn more about Dr. Hamilton visit featured members of the band page. Associate Conductor, joined the HSCB in 2002. He and his wife, Nyla, moved to Hot Springs Village from the Dallas area. Bill earned his Bachelor and Masters in Music Education at Texas Christian University and worked toward his Doctorate in Administration a the University of North Texas. A Band Director in the Dallas School District for 10 years, he subsequently became Coordinator of Music Education for the Dallas School District. He ended his career as Executive Director of Human Resources. Bill directs the Village Big Band, serves as Vice-President of the Hot Springs Community Bands Board of Directors, is a member and instrumentalist of the Village Chorale and serves on the Hot Springs Village Community Concert Association Board of Directors. To learn more about Bill Morgan visit featured members of the band page. 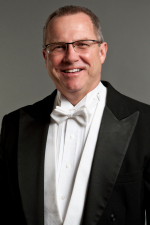 Associate Conductor, earned the Bachelor of Music Education degree from the University of Arkansas at Fayetteville in 1985 and the Master of Music degree (emphasis in instrumental conducting) from the University of Central Arkansas in 1998. He has been the director of bands for the Malvern Public System since 1999 and has been on staff at Malvern since 1990. Ken joined the HSCB in 2001 as a member of the trombone section. Ken's professional affiliations include the Arkansas School Band and Orchestra, Phi Beta Mu professional music fraternity, the American School Band Directors Association and he is a past president of the Arkansas Bandmasters Association. William "Bill" Crook studied music at Ouachita Baptist University and holds a B.A. in music. In addition to being one of the associate conductors of the Hot Springs Concert Band, Bill is the section leader of the trumpet section of the Hot Springs Concert Band and also performs locally with various music ensembles. William also serves as conductor of the New Horizons Band of Hot Springs. Bill is owner and proprietor of Crooks Music Service, a music store located in Hot Springs on Central Avenue.